Bright Crystal’s one of those designer fragrances geared toward younger consumers. It hits that purchaser’s sweet spot that’s totally into easy to wear, light and floral, and most importantly young and approachable. In Bottle: Rather strong presence of sharp green grapefruit and tart pomegranate. The florals try hard to make an appearance in the opening but the top of this scent is rather two-dimensional. Applied: The big fruity opening nets you in if you like fruity fragrances and the light floral heart will keep you around. This opens as a sharp yuzu/grapefruit with a strong flare of pomegranate before it digs into the mid-stage where a mixture of sheer clean florals awaits. The magnolia in this is particularly well done, it’s lush and pretty but not overpowering. There’s just enough of it to make you smell clean and flowery. That mixed with the cleaned-up girly lotus and the always girly and cleaned up peony and you get a mixture of some of the easiest to love florals in perfumery. The dry down is a cool green amber, kind of reminds me of sap, and a rather nice gentle waft of woods and clean musk. Extra: I think the word of the day here is “clean”. Bright Crystal is highly approachable, highly likable, and will not make people clear a circle around you. It’s really easy to love, and I do like it quite a bit. It’s not the most interesting composition in the world, but you have to hand it to Versace if you’re looking for a youthful and clean scent. Design: All right, I’m not a fan of the bottle. The color is pleasing, the shape of the bottle itself is simple and easy to like. But that giant, jewel-shaped cap is a bit too much for me. It does make the bottle stand out rather well, but it’s a tad too flashy in my opinion. Notes: Pomegranate, yuzu, iced accord, magnolia, lotus, peony, plant amber, musk, mahogany. Bright Crystal is a good choice for office wear or elevator wear. It’s just one of those fragrances that I have to lump into inoffensive and not much else. It’s one of the better inoffensive and not much else perfumes out there though. 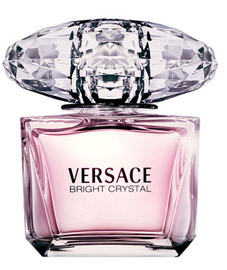 Reviewed in This Post: Bright Crystal, 2010, Eau de Toilette. This entry was posted in floral, Reviews By House, versace and tagged amber, iced accord, lotus, magnolia, mahogany, musk, peony, pomegranate, yuzu. Bookmark the permalink. Bright Crystal is one of those perfumes that just tells no story to me. I feel as if it’s about nothing, an empty place. Maybe it’s because it’s so popular and I’ve smelled it everywhere by now so I can’t even distinguish it from anything else these days. I hear you on this one. And totally agree. There’s no story to most mainstream releases these days–including this fragrance. You put it in much better words than me :-).